Good morning everyone! Happy happy Thursday to you! As you all know, my best friend Ashley is a huge source of inspiration to me when it comes to fitness. 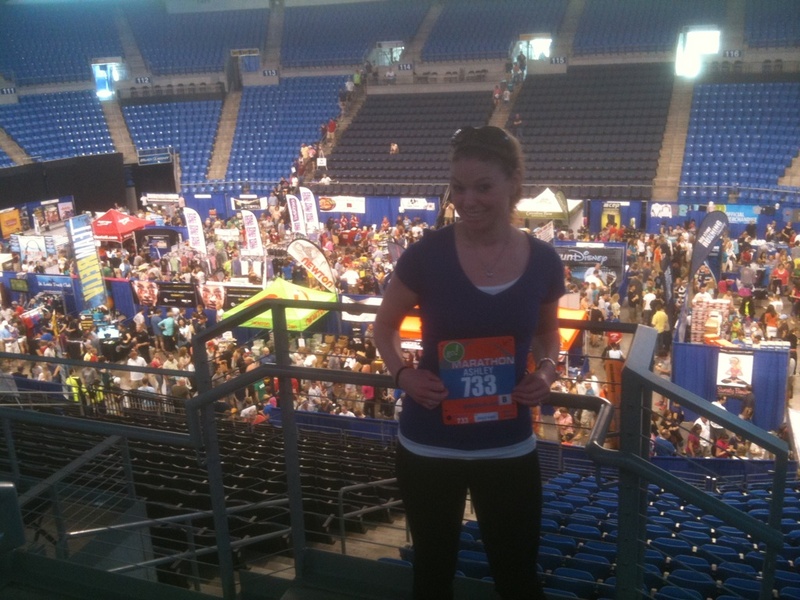 If you've been reading, you also know that she and her fiancé ran their first full marathon this past weekend, The Saint Louis Go! Marathon. As I knew they would, they did INCREDIBLE. The temperatures down there were insanely hot in the morning, it's a Boston qualifying course, and they both finished in very close to 4 hours! 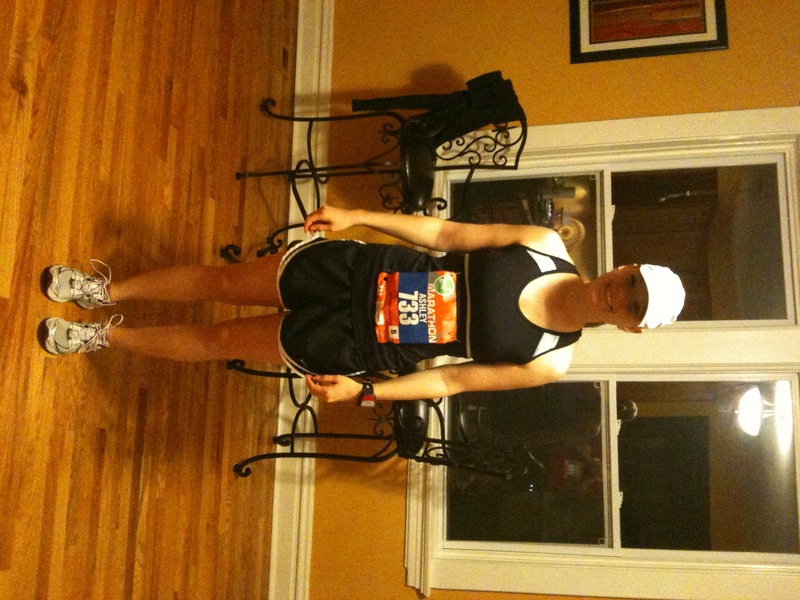 A while back I asked Ashley if she'd be willing to guest post for me to share her experience training for and running the marathon. I thought this would be a great topic for all of you runners out there who lace up your shoes for fun, or who might even be considering tackling the 26.2 mile challenge in the future! So, without further adieu, I will hand it on over to my superstar running friend, Ashley! When you look this word up in the dictionary, more than one meaning appears. When I sit back and look at these definitions, I can find the exact emotions and physical being that my mind and body went through this past Sunday; victory, endurance, prolonged effort. I think the major feeling post-marathon, if you can get past the fact that your whole body hurts more than it ever has in your life, is the sense of pride and accomplishment. It all started 4 months ago when a simple plan that was designed using Hal Higdon's Marathon Running plan, tweaked and put into Excel format, courtesy of my fiancé, Tyler. 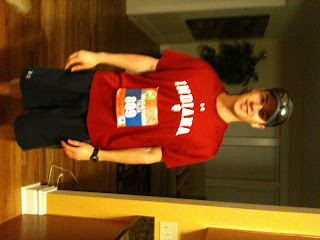 This marked the start of our journey toward the 26.2 miles we would complete in April 2011. As the weeks went by, the miles kept piling on. Feeling stronger and stronger the further and further we went. Hal’s schedule was easy to follow and kept us on our toes. We were continuously looking forward to the next long run the following week. Through rain, sleet, snow and hail, literally, we completed our miles on the schedule and approached the taper weeks. These are very difficult, but relaxing weeks. Your body gets used to running, 5 miles Tuesday, 8 miles Wednesday, and 5 again on Thursday, followed by a 15-20 mile run on Saturday, and now since you have built up the stamina and muscle in the weeks prior, the last 3 are here to repair and prepare for the upcoming race. 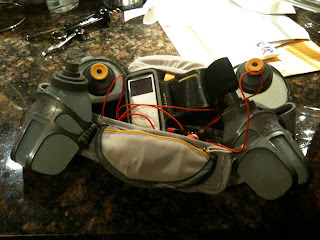 It’s hard to make yourself believe that you won’t forget “how” to run that 20 miles again. But somehow, your body remembers and feels even better. During the whole training process, Tyler and I found out what worked for us. We would eat whole wheat thin spaghetti with homemade pasta sauce and French bread every Friday night before a long run. The night before we would also get our Nathan water belts filled and ready to go for the journey the next day. These are a must. If you are running outside with no water fountain, these babies are great. They definitely took some getting used to and you feel like you look really silly, but after a while, you can’t imagine a long run without them. Getting a good night sleep the night before a long run is also essential. When running this many miles you have to be alert and feel your best to avoid injury. These long runs would lead to verrrry early Saturday mornings. Waking up anywhere from 5:30 to 9 am, my first move was to the toaster. I would make 2 pieces of wheat Healthy Life toast and spread peanut butter on each. 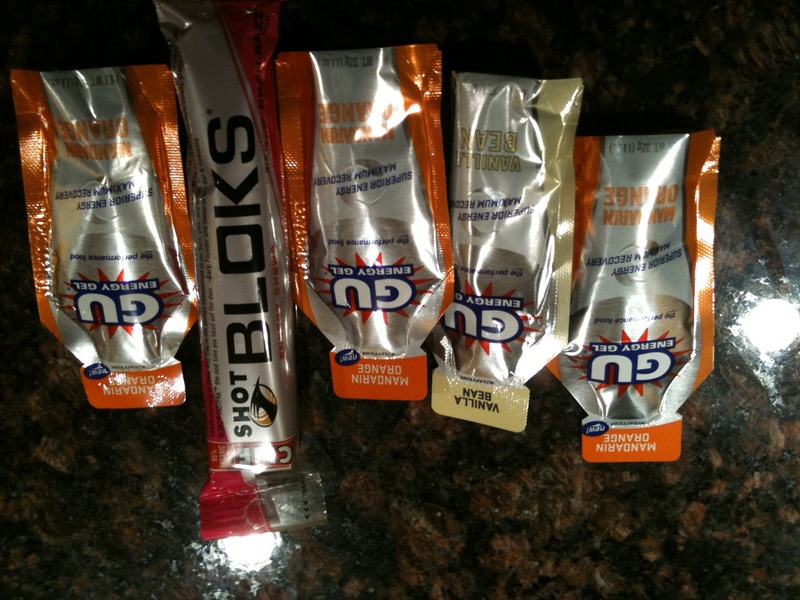 After devouring our fuel for the morning, we would slap on our Body Glide to help avoid chaffing, and then chose our GU flavors for the day (orange and vanilla along with a packet of Cliff Blocks). These gels provide the calories you need in an easy form for your body to digest; each pack is 100 calories, and they have caffeine in them! Think of them as your little espresso shots, but in many other flavors. I have also made a new best friend: my Garmin watch. This thing is great. It tells us how fast we are going and what mile we are on using satellites just like the one you use in your car. It’s an easy way to make sure you stay on track during your runs. I have definitely become reliant on this thing. 4:30 am. It was finally here! We ate our wheat spaghetti and bread the night before, laid out our clothes and had our race numbers all set; now it was 4:30 am and toast was in the toaster! 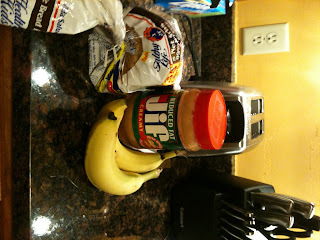 Because this was the actual race, we would be running the farthest we ever had and would not begin for another 2.5 hours, so we decided to add a banana into the breakfast mix. 5:45am. We arrived downtown and found a prime parking spot! We even had time to kill! Tyler and I ventured out into the starting area. Found the port-a-potties to make one last pit stop and then it was time to line up. Our nerves were getting the best of us at this point! It was already 71 degrees at 7:00 am at the start line, and we just wanted to get running! We knew it was going to be a tough day. This was the first time we would have run in temps over 65! As the race started the announcer said, which he says every year, “GO ST. LOUIS GO GO GO!! !” And we were off! We were using our Garmins and staying exactly where we wanted. By mile 4, our water belts were already empty. The heat was already taking its toll! We kept on truckin’ though, staying right in our zone. By the time we got about half way, mile 13 -15, I hit a huge wall! I was so hot and feeling nauseous. No water-until the next station which at this point, they were spread out every 2 miles. I relied on my running buddy for support. We got through it and started to come up to the point of the race I was looking forward to from the beginning. The course actually ran right by our house and my parents and Tyler’s brother and friend would be there waiting for us to cheer us on! We were approaching the point where I said to myself, if I made it here, we would be good to go! On our way to this “heavenly spot,” there was a bystander on the side of the road pouring beer samples! Something in me said, take one! So, I did! I know what you are all thinking! Ashley, you just said that you hit a wall and felt nauseous! I’ll tell you what, I don’t know if it was this little sip of deliciousness or what, but I found my second wind! We flew past our fans and were now on the last 6 to go! By this time, the temperature had reached the degree mark where the race officials decided if people had not reached the half way point, they would be turned around and be forced to complete the half-they could not go any further on the marathon race. Luckily, Tyler and I had passed the point of no return before they made this decision. The temp was climbing into the 80s and you could see it on everybody’s faces. Fortunately, starting at mile 17 the water stations were at each mile. All I kept telling myself was to make it to the next water station. I was literally running water station to water station at this point. I tried to get my mind off of the heat and started thinking about my after marathon celebration! Courtesy of Jess and Justin, we had “Go Go Juice” cups waiting for us when we got home! I can’t tell you how motivating the thought of these were! I could already taste the Orange Passions! (Orange soda and Vodka). Mile 25 came and from this point in the race you could see the mile 26 flag. Then you could see the finish line! Closer and closer and then finally, FINISHED!!!! 4 hours 7 minutes and 6 seconds! What a feeling. I felt so worn out but so great at the same time! Collecting our medals and of course our free beer sample of Michelob Ultra, we felt amazing! Besides hurting so, so badly, it was a good hurt! I am writing this on the Wednesday after the race. I was finally able to get a workout in this morning, but I am still hurting. I have a feeling it will take a couple more days, but that is ok with me! Feeling the soreness just makes me feel even more accomplished! Warning! Once you start running and training, it becomes addicting. But I guess it’s one of the best addictions to have! It was a blast, and I can’t wait for our next one in October! Wow! If that doesn't get you inspired to hit the pavement, I don't know what will. Ashley had some really great tips for runners, didn't she?! I know I'm going to be reading and re-reading this post as we train for our half (and maybe eventually a full!) marathon in the future. Have a terrific day and I will see you back here tomorrow for fuh-reaky Friday! !